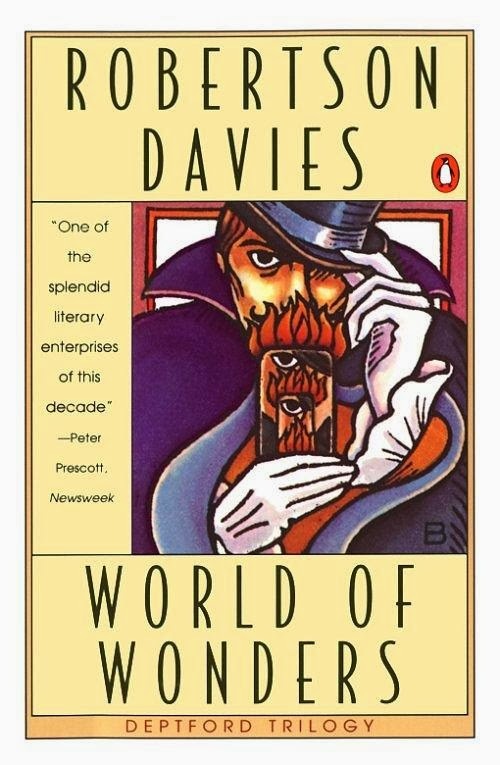 My 5 star rating of this book really reflects my feelings on how I think Davies masterfully wrapped up the Deptford trilogy than it does an individual rating for this volume itself (don’t get me wrong, it’s great, but I think Fifth Business is the strongest, and best, volume in the trilogy). I guess I’d say that the individual books themselves range from around 3.5 to 4.5 stars, but the series overall is a five star read. As with all of the Deptford books World of Wonders is a personal memoir that gives us further insight, from yet another angle, into the lives and motivations of the characters we met in earlier volumes, most of whom hailed from the small Ontario town of Deptford. The ‘problems’ of the memoir style itself (the inescapable desire to make oneself into the hero, the inability to really understand the motivations and actions of others from one's limited point of view, the unreliability of looking back onto the past from the vantage of the present) are perhaps brought even more to the fore in this volume than they were in the others as we sit back and listen to the harrowing tale of the life of the mysterious magus Magnus Eisengrim, né Paul Dempster. Magnus, along with our old friends Dunstan Ramsay and Leisl Vitzliputzli, is in the midst of starring in a film in which he is portraying the legendary conjurer Jean Eugène Robert-Houdin. During the course of filming, and in a completely characteristic attempt to demonstrate his own personal greatness and provide a ‘sub-text’ to the film, Eisengrim decides to reveal to his friends and the filmmaker’s entourage the details of his life that led to his becoming, in his own words, the greatest conjurer that has ever lived. It is certainly not a story that bears any resemblance to the romantic ‘biography’ fashioned by Ramsay as a piece of propaganda for Eisengrim’s Soiree of Illusions. 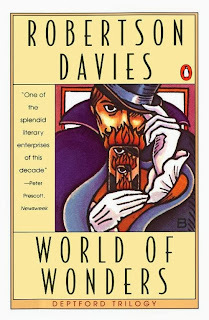 What we are instead presented with is a tale of abuse, loneliness, and fortitude as we see young Paul Dempster kidnapped from his awful home in Deptford only to have it replaced by an awful purgatory in the travelling carnival Wanless' World of Wonders. Eisengrim (only the last in a long line of many aliases) is truly a ‘self-made man’. As he himself mentions, the treatment and conditions under which he lived from the age of ten onwards were of a kind that would either have killed him early or strengthened him beyond expectation. Luckily for Paul Dempster the latter proved to be the case. We see how a lonely, frightened boy could be transformed into the monster of ego and talent that was Magnus Eisengrim, and once again observe how the ripples of effect from one small action (the throwing of that fateful snowball on a cold winter day in Deptford in 1908) helped shape yet another life. Eisengrim, for all of his suffering, is not a sympathetic hero (though hero he is, in all of his outsized grandeur) and once again it is fascinating to see the same characters and actions from the previous volumes of the trilogy as viewed through a completely different lens. Luckily (in my opinion at least) we once again have the voice of Dunstan Ramsay, that clever old schoolmaster and saint-hunter, though in a decidedly minor key. Eisengrim is certainly not going to let anyone interfere with his own personal hagiography, but Ramsay’s caustic tongue is given some range of expression and his scholar’s eye is always on the look-out for ‘the truth’ (at least inasmuch as he is able to perceive it). We discover in this tale the final pieces of the puzzle in the coming together of Magnus, Leisl and Ramsay and the production of that great work of illusion and art, the life of Magnus Eisengrim (as depicted in his own Soiree of Illusions), but I will leave the details of Paul Dempster’s ‘hero’s journey’ to you. Rest assured that the culmination of it is a thoroughly entertaining, one might even say enlightening, tale that takes us very far indeed from the environs of little Deptford but still manages to come full circle and comment on the series that was born there as a whole. Boy Staunton, that unchallenged giant and yet largely obscure figure in the lives of others, makes his final appearance and we can now look back on the many stories of the Stauntons, the Ramsays and the Dempsters in order to get a much fuller (though still never really complete) picture of those intertwined lives that affected each other in such significant ways. So, I would guess, do all of our lives (knowingly or unknowingly) intertwine and create an inextricable web of story and interdependence, whether we realize it or not.